A lot of DIY fans like to get the best palm sander. In many woodworking projects, you may want to sand the wood you’re working with so that they’re nice and smooth. Instead of manually rubbing sandpaper on it, you can instead use a power sander to sand the wood for you. The palm sander is a type of power sander, and it is compact and lightweight. It’s as if it will fit in your hand comfortably. Because it’s small and light, it’s actually quite affordable for the most part. It’s also very easy to control. You just attach a glasspaper sheet to the bottom, and you can control much like the way you control the iron for your clothes. There’s also usually a dust collection system attached to the palm sander as well. The Dewalt brand is always a good option to consider when you’re looking for power tool, since they have such a good reputation for quality products. The warranty for their tools is usually for 3-years, with a year of free service and 90 days for the money-back guarantee. That’s the same set of warranty conditions for the D26441. It’s quite powerful, with the 2.4-amp motor offering a nice finish with its 14,000 rpm speed. The pad is square, so you won’t have any trouble sanding the corners. It’s easy enough to use, as it weighs about 3.56 pounds. At the top, the surface is textured so that your hands don’t slip when you maneuver the sander. The body grip is also easy enough to grasp firmly. The balance is good, and it doesn’t produce a lot of vibration that can tire you out in just a short time. It’s very easy to control and it’s comfortable in your hands too. It also comes with a dust bag that can collect a large amount of dust. And this also comes with a vacuum adapter. This means that you can just connect it to your shop vacuum to minimize the mess. The fine dust resulting from high-powered sanding can do a lot of damage to power tools, but such a problem has been anticipated. So the solutions are already in place. The switch is sealed against the dust, so it doesn’t let the dust come in which can shorten the lifetime of the switch. The 100% ball-bearing construction is similarly sealed as well, so its system can work smoothly without any dust to cause problems. With such a great set of features and an impressive warranty, the low price is also quite surprising. The D26441 really does offer a lot f value for your money. 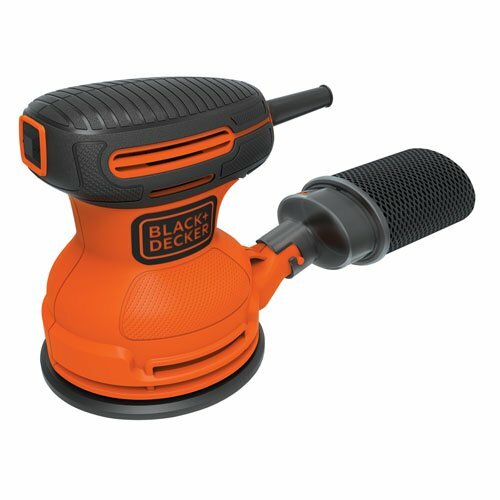 The Black & Decker BDERO100 is the cheapest of the lot on this list, and it’s one of the reasons why it’s a bestseller online. But it’s not the only reason for the popularity. may not even be the main reason. Obviously, the Black & Decker brand name is part of its allure. It’s a well-known brand, and most people are comforted by the name recognition. What sets this apart from other sanders is that it sands the wood using a random orbit sanding pattern. 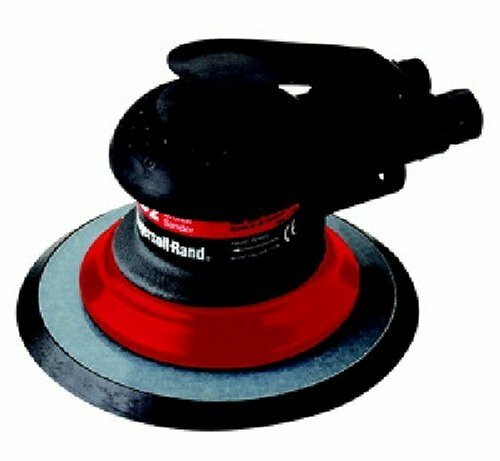 The sander spins the pad that holds the sandpaper, and also moves it in small ellipses. This guarantees that there’s no part of the sandpaper that travels the same path on the wood twice during a single rotation. It doesn’t leave swirl marks, you won’t have to factor in the direction of the wood grain. This makes sanding faster, and it also reduces the number of fine circular scratch marks on the wood. Instead of adhesive, the sandpaper is secured in place by a hook and loop system. This makes it easy and quick for you to make your sandpaper changes. There’s no need to be super careful while you remove and apply the sandpaper. The palm sander is also quite compact and light, and the handle is nicely ergonomic and shaped well for the hand. The switch is sealed from the dust so that the service life of the sander is extended. The dust collection system is also very effective. Overall, it’s an impressive set of features from such a “cheap” palm sander. Makita is a famous Japanese brand known for the quality of their power tools. In fact, it’s been in the electric machinery business since 1915. They’re very innovative, and they’ve been responsible for quite a few “firsts” in the power tool industry. The BO4556K is a fine example of how great their power tools are. This one offers up to 14,000 rpm of sanding speed, and yet its ball bearing construction seriously reduces the noise it makes. You won’t really bother the neighbors as much with this sander, and you won’t need to put your own eardrums at risk. Yet it weighs just 2.4 pounds and it’s compact at 5.125 inches in length, so it’s very easy to control. The palm grip fits like a glove in your hands. It’s comes with contoured rubber for a comfortable grip, and it’s also ergonomically designed so your hand rests comfortably while you maneuver it. The ball-bearing construction also reduces the vibrations too, so your hands don’t tire too soon. The switch is sealed with rubber, to prevent dust from contaminating it. Removing and putting in the sandpaper is a cinch with the large paper clamps that hold it in place. The dust collection system gathers the dust “through the pad” to help you maintain a clean jobsite. The fabric dust bag even has a wider mouth, so it’s much faster to empty it and you can get back to work sooner. Your purchase includes the abrasive paper, the dust bag and a tool case. This Makita sander comes with a 1-year warranty. 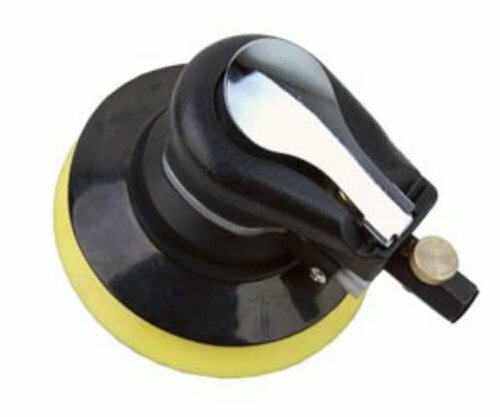 This is another random orbital palm sander, so it offers a finish that’s free of any swirl marks. But it’s not just the random orbit pattern that makes this sander special. With this one you can really speed things up. First of all, the free speed is impressive, because it reaches up to 10,000 rpm. What’s more the pad size is 6 inches. So this means you sand a larger area with more passes, and that should accelerate the work pace nicely. It also helps a lot that this is very easy to use. 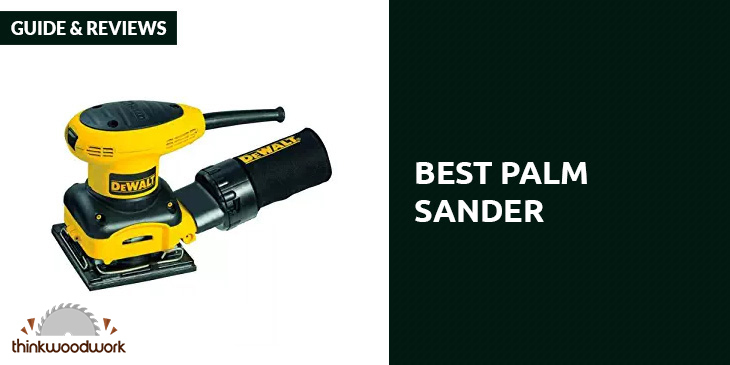 It’s much more comfortable and you feel less fatigue with this sander in your palm. The grip is comfy and ergonomic, it’s compact, it is very light at a mere 1.65 pounds, and the vibrations have been reduced. It’s also ready to have your vacuum attached. And it also comes with variable speed control, so you can determine just how fast the sander moves over your wood. To keep this working properly, you will have to keep it oiled regularly. Your purchase also includes oil as well and you should just replace the oil when it runs out. 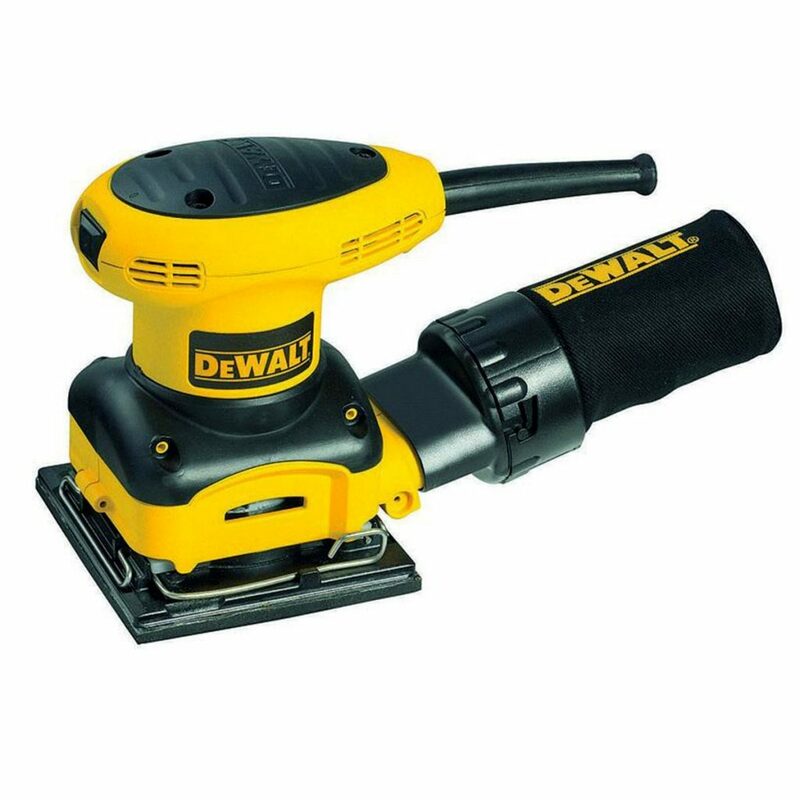 It’s a tad more expensive than the others, but with advanced features like variable speed and faster sanding, you may find it worth the extra few bucks. It comes with a 1-year warranty. The Ingersoll-Rand IR-4152 is the most expensive sander on this list, but the high price is justified by the terrific features. 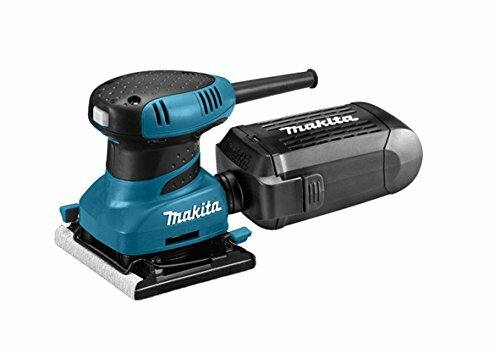 This will really get your job done faster, since the sanding pad measures 6 inches, the motor provides 12,000 rpm, and it uses a random orbit sanding pattern. You don’t get any swirl marks either. But there’s more. The counterbalance has been precisely set, so it reduces the vibrations that can tire your hand out in no time. The dust collection system is especially effective, as it gathers the dust through and around the pad away from the motor. The lubrication-free motor also makes sure that there aren’t any exhaust contaminates that can ruin the wood you’re working on. Maneuvering this around your wood surface is a snap, as it is compact and light at less than 2 pounds. The grip is more than ergonomically designed—you actually different grip rings you can install so you can match the size of your hands. The warranty is good for a year, but this can probably offer superior results for a long time. If your project demands high quality, then this is your best bet. Who says you have to sand your wood by hand? That will take hours, but with a power sander it can take mere minutes. Use the best power sander you can find, and you can complete your woodworking projects more quickly and with better results. For most pros and DIYers, a miter saw will be useless when there’s no miter saw stand. After all, the best miter saw stand can give them a solid foundation and come up with accurate cuts. Although it is also true that you can come up with a make-shift miter saw stand, there’s no certainty that it would be stable especially on uneven surfaces. And that could have an effect on your cutting job. The best miter saw stand not only results to accurate cuts. It is also easy to transport. You can also easily set up and break it down. And you can use it for a long time. There are many miter saw stands available in the market that you might get confused on which model to get. But I have made shopping a lot easier for you by picking the five best miter saw stand models today. Very sturdy and versatile miter saw stand. This one is made of heavy duty, 1.5 inch tubular steel. Basing from the reviews on Amazon.com, I can say that it is very durable and should last long. Some reviewers on the said website call it the best miter saw stand. I particularly like that this unit features Bosch’s gravity rise system. It is designed for quick and convenient set up and breakdown of the stand. You simply turn the release lever and put both your hands on the unit to set it into a working position. It is also has 8-inch pneumatic wheels which I found to be very solid. It is compact and easy to maneouver around when it is folded. But when it is set up, Amazon.com reviewers say it is very sturdy and stable. There are also rubber-feet that prevent scratches when you place the tool on a cabinet. 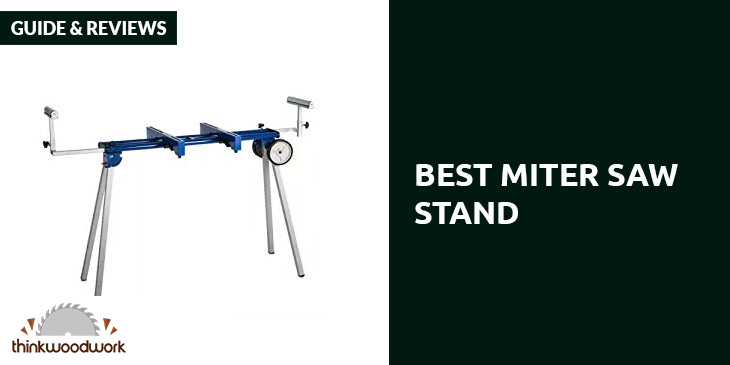 This miter saw stand can accommodate miter saws from other brands. It has a well-designed tool mount assemblies. One is a sliding mechanism located in the rear, while the other is a swiveling mechanism up front. These assemblies can accommodate various hole patterns of different miter saws. The only thing that prevents this from being the perfect miter saw stand is its weight. Weighing a whopping 77 pounds, this unit is very heavy. You would need some help in moving it around, unless you’re the Hulk. It can work with a sliding miter saw that is up to 12 inch long. It also has big, 8 inch treaded wheels that make transport a lot easier. Plus, it is relatively lightweight at 50 pounds. This miter saw stand also folds up easily, so you can put this away in the corner. It also connects and disconnects quickly. Because it folds to a more compact size, you can put it away in a corner of the garage or workshop. Many Amazon.com users say they can connect/disconnect the miter saw in less than two minutes. The consensus among reviewers is that it is very sturdy and adequately sized for most projects. They say that it stands on well with a miter saw attached. It has slip-on anchor plate attachments, allowing the unit to be screwed down to the floor when not in use. Assembly, however, isn’t as simple as some Amazon.com reviewers had wished. Others also say that this unit is designed for home remodelers. They don’t see it holding up to the abuses of heavy duty commercial constructions. Moreover, it is not designed to be transported with the saw attached, particularly if it is to be taken upstairs. This is a miter saw stand that serious DIYers, weekend warriors, and contractors will find very impressive. There are lots of good features integrated in this unit. One of those is the pneumatic lift system, which would let you raise and lower the saw stand easily. Basing from the reviews on Amazon.com, this feature cuts the time needed for setting up the unit. You’ll have more time for the actual cutting. 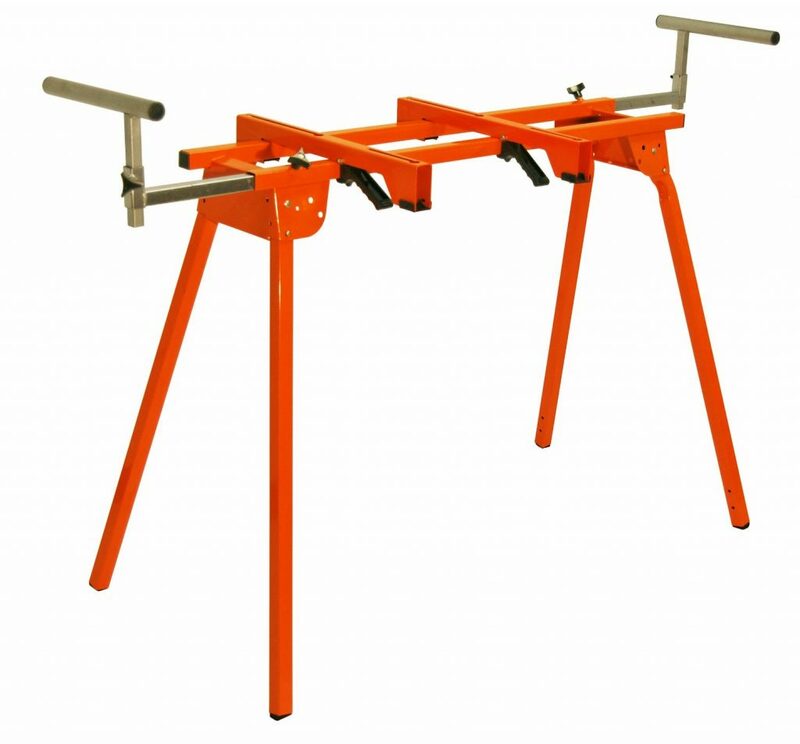 This is a versatile saw stand, capable of fitting most miter saws even from other brands. It has a weight capacity of 300 pounds, so this should be good for most DIY and woodworking projects. It can support materials up to 8 feet long. Sure, this saw stand isn’t easy to lift. It weighs 67 pounds which isn’t lightweight by any standard. But it does have a rolling stand that makes transport a bit easier. The rubber tires would also let you roll the unit over most terrains. It is very easy to set up. Simply tilt down the unit, pull the lift lever, and then raise the table. Assembly can be quite confusing, though. DEWALT could have added a diagram to assist users in assembling the unit, but sadly, they didn’t. Other users aren’t fond of the wheels of the unit. They say that it is small and feels cheap as it is made of plastic. If you’re a contractor or a DIYer serious with your work, then this is a miter saw stand that you should give a second look. This is rugged but lightweight unit that can support up to 500 pounds. It is made of tubular steel, thus there should be no question about its durability. It is also quickly folds for easier storage and transport. I like that this saw is easy to put on and take off with its release handles. The handles are oriented to the back of the saw. You may think it’s weird but you’ll realize why HTC put the handles at the back. This way, you can use your belly to support the saw while you carry the unit. The unit itself isn’t that heavy, with a weight of 30 pounds. This miter saw stand is upgradable. It comes with a separate kit that includes six-inch wheels. 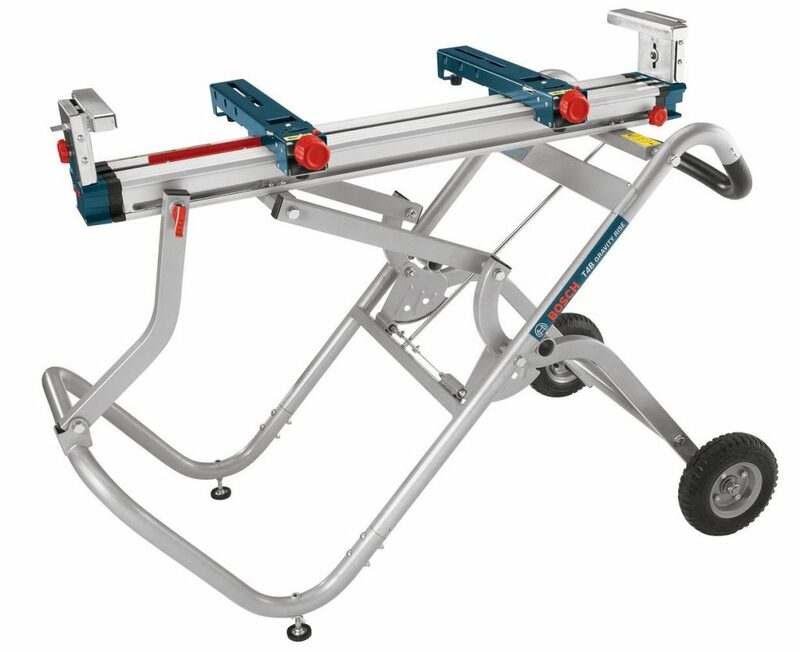 You can add that in this unit if you want the miter saw stand to be transported from one site to another. It may seem like another cost, but many of those who have installed the kit say it is actually a great addition. It makes transport of the unit a lot faster. Installing the wheels and hardware isn’t that difficult as well. You can also add quick mount machine attachments in this miter saw stand for easier changing of tools. The attachments can maximize your unit’s capabilities. 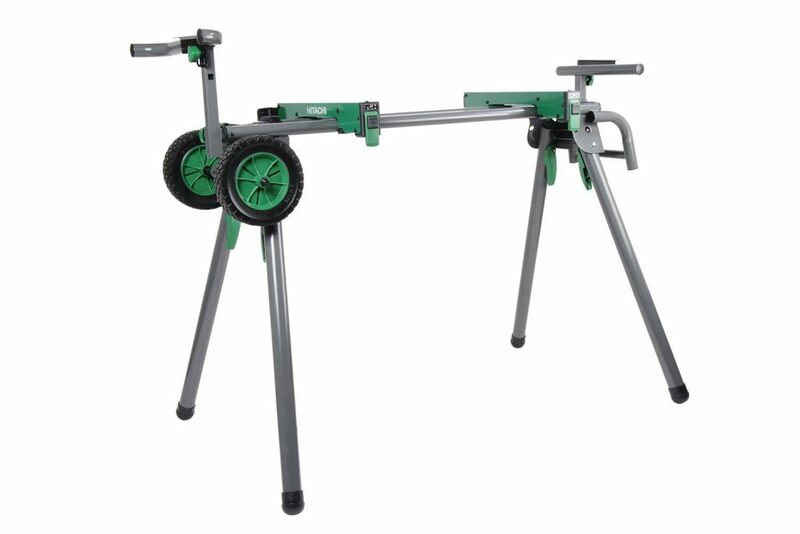 With its weight and release handles, there’s really no need for wheels in this saw stand. I just thought HTC could have added adjustable legs to this unit. 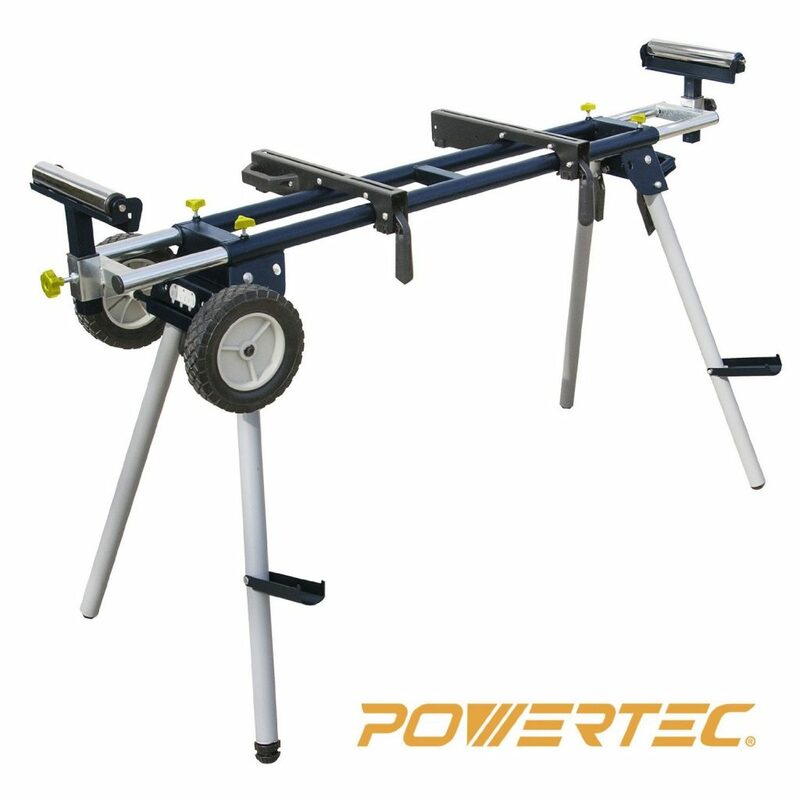 This miter saw stand is also ideal for woodworking and DIY projects, with a weight capacity of up to 330 pounds. It has two adjustable steel rollers that you can rely on to support your work piece. Then there's a three-outlet power strip that basically means you no longer have to work near a wall out. Many satisfied customers describe the miter saw stand as having outstanding features that you’d only find in more expensive units. They say it is the best miter saw stand right now. For one, the unit is very stable saw stand with adjustable leveling feet for uneven surfaces. Moving it around won’t exactly be a challenge with its two 8-inch rubber wheels. And it is also relatively lightweight at around 40 pounds. The wheels are big with a diameter of 8 inches. The rubber tires also make the stand very easy to roll. You can do that with or without the saw. And when you fold the saw stand, it collapses to a more compact unit that you can store at the corner of your shop or garage. There are just some minor design issues that may disappoint you. One is that the roller on the right side blocks the use of the handle. The cord providing power to the outlets is also a bit short. I highly recommend any of these miter saw stands. These are highly rated units on Amazon.com. You can go ahead and read reviews of each unit on the popular website so that you will know how impressed DIYers and contractors are with these products. Then make your choice depending on your needs, as well as your budget. 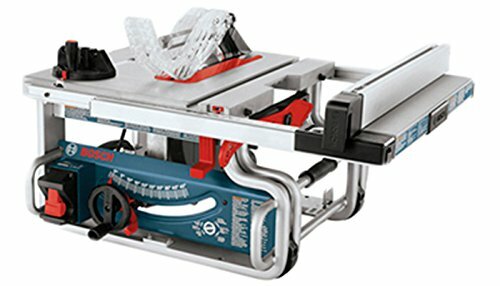 Regardless of the miters saw stand that you will purchase, it is safe to assume that you won’t regret it. You’ll be able to get a miter saw stand that would let you have more accurate cuts, and make good use of your miter saws. Buying a miter saw stand is a lot better than making a makeshift saw stand. It’s easy enough for any handyman or DIY fan to understand the need for a table saw in the workshop. They’re just too useful to do without. What’s a lot harder to justify is spending too much money on one, especially for those who aren’t well-off or for hobbyists who just like to take on projects every now and then. 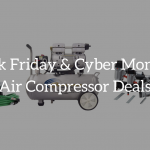 But the truth of the matter is that unless you’re a professional contractor who insists on spending top dollar for top equipment, you don’t really have to spend all that much. It’s not difficult to find the best table saw under $500 which can suit your needs as well as your budget. Certainly you can start your search with the models we have here. And chances are that your search may end here as well. 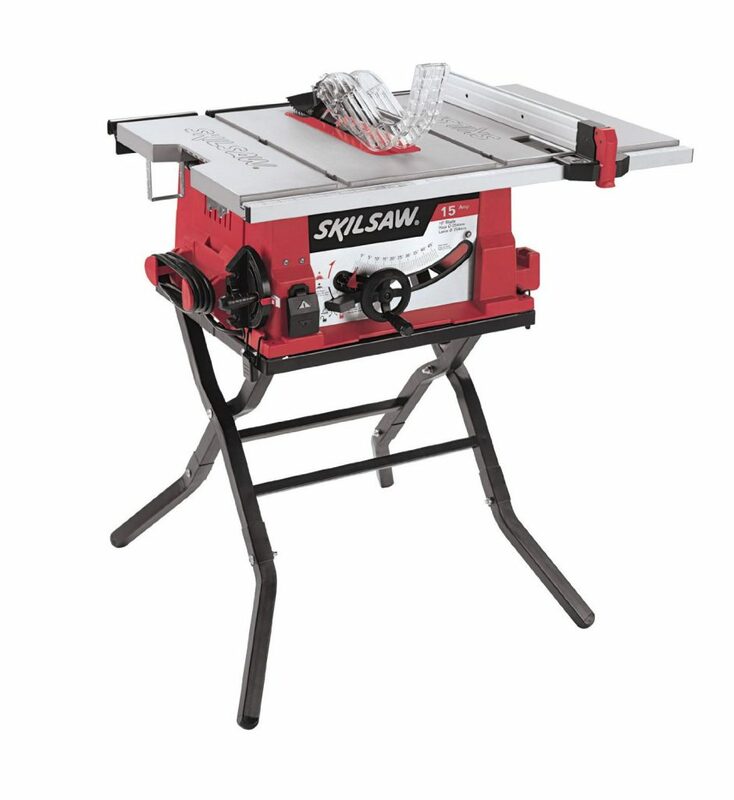 Let’s start the list with an obvious contender for the title, as the DW745 is a top seller among all table saws online. It comes with a 10-inch blade, which is a more practical choice than a 12-inch blade since very few of us really work with very large work pieces too often. 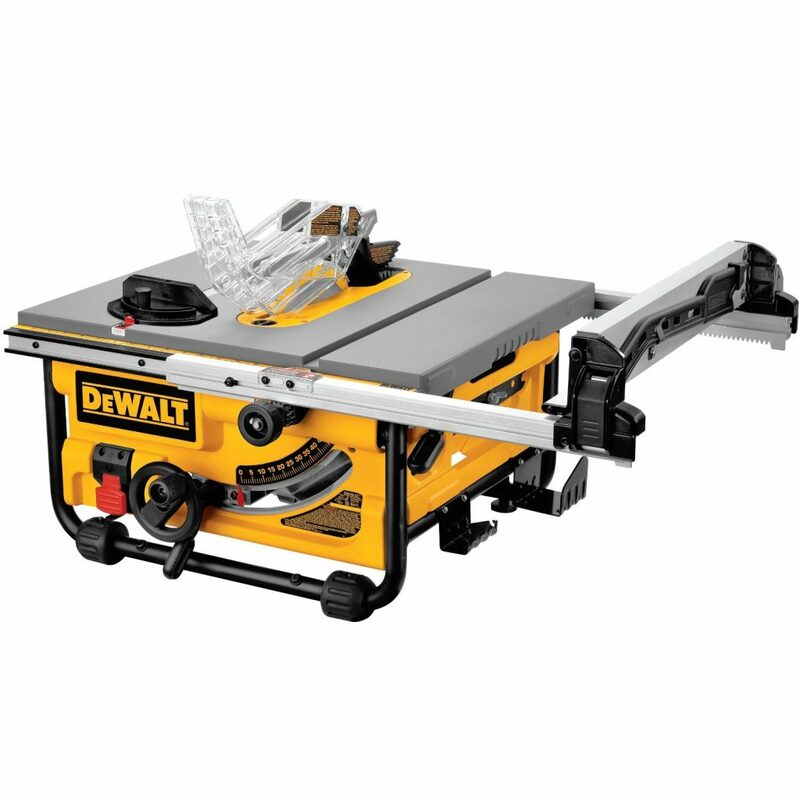 This blade is powered by a 15-amp motor able to offer a speed of 3850 rpm, which means that you can get clean cuts quickly even if you work with engineered or hardwood lumber. The rails allow for quick and accurate fence adjustments. The telescoping design of this saw move the rails out to 20 inches so it can rip full sheets of materials. At 90 degrees, the cut depth reaches 3⅛ inches while at 45 degrees you still get a cut depth of 2¼ inches. It also comes with what Dewalt calls its Site-Pro Modular Guarding System. This basically allows you to adjust guarding components without the need for tools. So with this system, it’s easy to set up the table for a wide range of different jobs. It has a metal roll cage base, which is much sturdier and more stable than a plastic base. The table surface is even coated to reduce the friction, which lead to a better quality for your cuts. The 2.5-inch dust collection port also lets you connect to a shop vacuum so you can minimize the dust and keep your workplace clean. Since the rail has a telescoping design, it retracts so the design is more compact. That makes it more portable, and besides, it weighs just 45 pounds. There’s even on-board storage for the guarding components so you have a handy place to put them when you’re not using them. As for its durability, just remember it’s a Dewalt. That means it has a 3-year warranty and you get free service for a year. You also have 90 days to try it out and if for some weird reason (which you don’t have to explain) you don’t like it, you can return it and get your money back. Judging by the rave reviews this model tends to get, that’s a very rare occurrence. 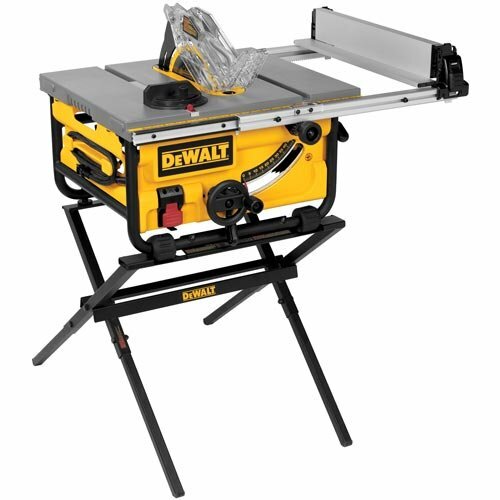 The DWE7480XA is another great table saw option from Dewalt. While you can get it without a stand, it better if you do. This means you get a stand that’s precisely made for this table saw, and besides it’s just $20 extra. The blade can also be adjusted up to 45 degrees. It also comes with the rack and pinion telescoping fence rails that allow you to adjust the fence quickly and accurately. Again you also have the Site-Pro Modular Guarding System, which offers various guarding components that can come handy for different applications. Other familiar features include the 2.5-inch dust port, the metal roll cage base, the on-board storage for the guarding components, and the table coated to reduce friction. But this time the 15-amp motor offers a speed of 4800 rpm, and the rip capacity is increased to 24.5 inches. The rear feet are also adjustable so that you can level the saw if your workshop floor is a bit uneven. It’s still compact at 26.5 x 25.8 x 17.5 inches, and even with the stand you should have much trouble moving it from one spot to another. Setting it up is easy as the manual is detailed. Again, let’s mention the Dewalt warranty: 3 years limited warranty, 1 year free service, and 90 days for your money back. Bosch makes a point of putting the word “portable” in its product name for the GTS1031, because it really is portable. It really is designed to be more mobile than your average table saw. You can use its single handle to lift it up yourself, and this handle is actually ergonomic and soft when you grasp it. You’ll then find that its 52-pound weight is nicely balanced for lifting. 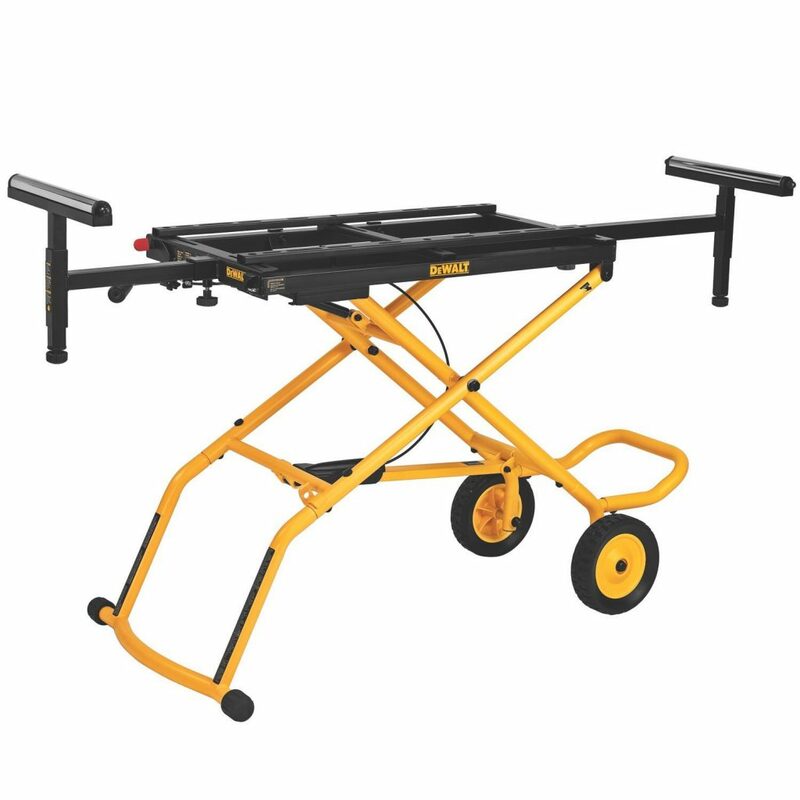 With this terrific center of gravity, it won’t be awkward to move it from place to place in the jobsite.It also has handles on the side, so that it’s easier to load the table saw in your truck. The base will stack on the side, which makes it easier to transport and stable when you store it away. Yet despite its portable nature, it still has an all-steel base that can hold up to workshop and jobsite conditions. It offers storage for various tools and components under the table, and the base has rubber feet for better stability. It also has a tool-free dust chute clear-out to make maintenance easier. But how does it cut? You be the judge. It has a 4-hp motor that delivers a speed of up to 5000 rpm. While it’s compact for easier transport, the 20 by 22.5-inch tabletop still offers 18 inches of rip capacity. The bevel angle range goes from -2 to 47 degrees. At 90 degrees the cut goes 3⅛ inches deep, while at 45 degrees the cut depth is 2¼ inches. What’s more, its fence is designed to be the best and most accurate in its class. The fence just glides along the rail so you can use a single hand to move and lock into place. You also get superior control with your cutting, which boosts your safety as well as the accuracy for your cuts. So all in all, you have a mobile cutter that offers extremely accurate cuts. If you like to keep things moving, this one’s for you. Yep, it’s another Dewalt. As it should be obvious by now, Dewalt delights in delivering high quality power tools at very reasonable prices. However, this one is the most expensive of the bunch, as it comes in at just a hair short of the magic $500 price point. So let’s explain the higher price. Aside from all the other features we’ve already repeated, here the rip capacity is boosted up to 28 inches. The table is substantial, as it measures 26.25 by 22 inches.It’s probably easier to explain its advantages to various types of people who will use it. With this, cabinet installers and hardwood floor installers can rip filler boards. Deck builders can use it for ripping deck boards, rail cap, and railing. Remodelers and hobbyists can rip framing lumber and work with 4 by 8 feet sheet material. Trim carpenters will have a lot of use for this. It can rip molding and framing lumber. It can be used for wainscoting. It can be used to rip and cross cut materials for framing books shelves and TV cabinets. Home hobbyists can use it to rip and cross cut materials for tenons, mortise, rabbets, and dadoes. It can size materials up to 3 inches thick. When you see just how useful this thing is, you can understand the price discrepancy with the other models on this list much better. But it’s still affordable, as it’s still less than $500. Here’s another nice table saw you can get for much less than $500. The 15-amp motor also delivers 5000 rpm speed, so you know you have ample power. You can use this for all kinds of workshop tasks, including crosscutting smaller work pieces, ripping long boards, and making miter or bevel cuts. The rip fence is self-aligning and the highly visible (SKIL calls it “EZ View”) measurement system helps make sure that your cuts are accurate. The bevel range is from 2 to 47 degrees. At 90 degrees, the maximum cut depth is at 3.5 inches, while at 45 degrees it’s still 2.5 inches. The maximum dado width is 13/16 of an inch, and it can accept an 8-inch dado blade. The maximum rip capacity is 24.25 inches on the right side, and 12 inches on the left. For safety, there’s the blade guard with riving knife, plus the anti-kickback pawls. It also comes with its own heavy duty stand. 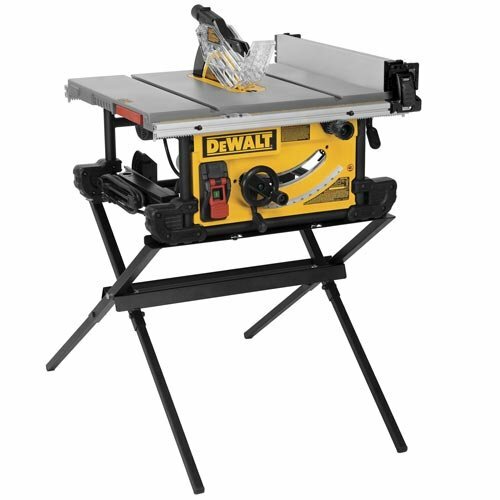 When you consider everything along with the 3-year warranty (with registration), it’s a great table saw for its price. If you’re not a serious DIY hobbyist, you don’t have to pay serious money to get top of the range table saw. 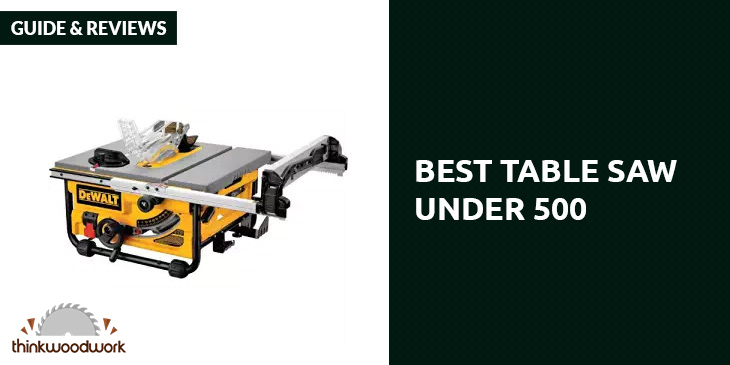 Find the best table saw under $500 on this list, and you’ll get yourself a bargain of a table saw you can use for many types of projects.